That title is a bit misleading actually, because if you look at the official paperwork, this home is most definitely Laurie’s. When we bought this house, I only had one year’s proof of income. Getting a mortgage as a self-employed person is complicated. You need to have your official HMRC statement thing as proof of earnings and even though I’d been self-employed for about two years when we bought the house, I only had a statement for the first financial year. And in that year, I’d only registered as self-employed about two weeks before the end of the tax year and so my statement showed I had made a whopping £200. The world has actually gone crazy. It’s way cheaper for us to have a mortgage on this house than it would be to rent this house. I think this house would cost a few hundred more each month if we were paying a landlord instead of a mortgage. Isn’t that crazy? How is anybody meant to save for a deposit when renting costs to much? I think it’s ridiculous. I hate this culture we have over here where it has become pretty much impossible for young people to buy houses. It’s even worse when you think about how the people renting are worse off simply because rental prices are so high. Over the years, I have lived in five rental homes. Every single one of them had damp issues. The last house I lived in, a rental in Oxford, was pretty much made of water because it was so damp. We used to get the biggest spiders ever, I’m pretty sure they love the damp. A lot of houses suffer from, especially old houses and this house was actually pretty damp when we bought it. As soon as we moved in we had a damp proof course put in, fixed some structural issues and re-rendered the exterior. When you live in a HomeLet, you have no control over the situation. I’m pretty sure every landlord I’ve ever had said all damp issues were caused by condensation. Erm, no. When we moved in, this house looked like a standard rental home. Everything was magnolia and the floors were carpeted in a cheap brown resilient carpet. Some of the house is still like that, but we have been able to decorate some rooms since we moved in. I hate the magnolia so am slowly painting the whole house white (why always white? I’ve no idea. I must lack imagination). We’ve put a lot of work into the house so far. 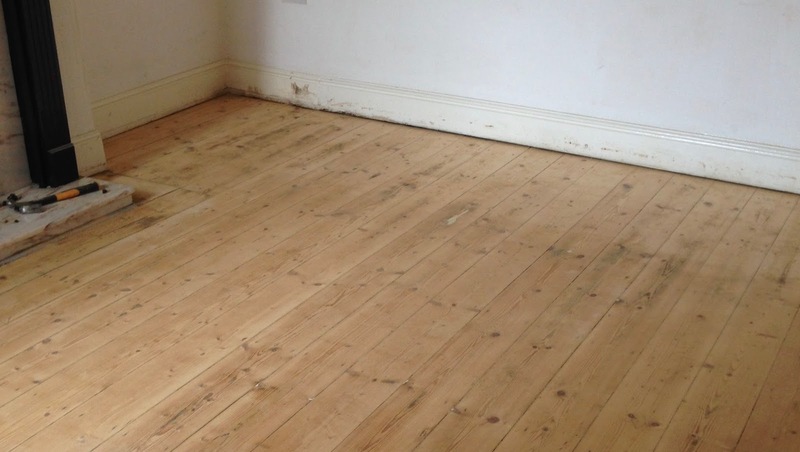 I can’t count how many hours Laurie spent stripping and sanding the floorboards in the living room, but we really would never have gone to such effort if we didn’t own the house. In fact, after all the work Laurie put in on the floor, I’m pretty sure he’ll want to live here until he dies. If this was a rented house, there are certain things that would be driving me crazy. The unfinished panel to cover the pipes in the downstairs bathroom, the ramshackle conservatory at the back and the face you can’t get into the small loft. These things would annoy me so much if I was waiting for a landlord to sort them out. But, as it is, I have to sort them out myself (or get my dad to) and so I’m not in such rush. Who can be bothered sorting the loft out, really? Not a landlord and not me either. Life is never certain, but I do feel that there is some level of safety in owning your own home. Obviously, there is a mortgage to pay and so it’s not entirely ours, but we’re not at the whim of a landlord. I would hate to find out our landlord was selling and so we would have to find a new place to live. And I’d hate for a landlord to put the rent up and price us out of our own home. I don’t think you can really get attached to something that isn’t yours, which is one reason I love that this house is ours.